John Robbins Justice of the Peace"
"Massachusetts, Town and Vital Records, 1620-1988," indexed database and digital image, Ancestry.com (https://www.ancestry.com : accessed 20 September 2012), "Sterling Births, Marriages and Deaths," Marriages, page 261 (penned), image 231 of 1007, Sophia Buck and Lambert Brigham entry. 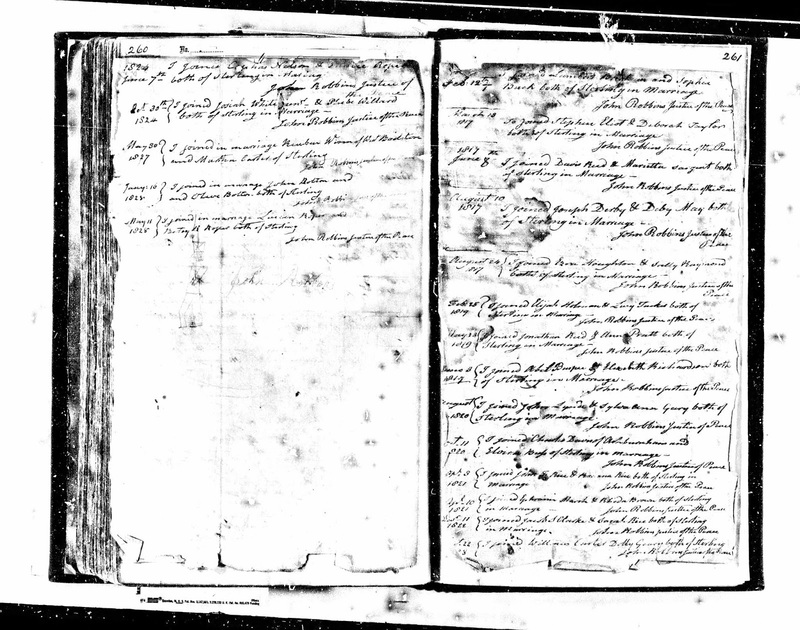 This is the record of the marriage of Sophia Buck (1797-1882) to Lambert Brigham (1794-1834) in Sterling, Massachusetts. This may be a Derivative Source record because it may have been copied from another, earlier, record book. It is a record with Primary Information and Direct Evidence of the names of the parties and the date and location of the event. Sophia Buck (1797-1882) was born in Holden, Massachusetts, the daughter of Isaac Buck (1757-1846) and Martha Phillips (1764-after 1820). Lambert Brigham (1794-1834) was the son of Phineas Brigham (1755-????) and Lydia Batherick (1752-???? ), and was born in Westborough. Lambert Brigham is the first husband of Sophia Buck, and was the father of two sons by Sophia. After Lambert died in 1834, Sophia (Buck) Brigham married, secondly, to Thomas J. Newton in about 1834, and had two children by him. I have no idea what happened to Thomas J. Newton, but Sophia married, thirdly, in 1862 to Jonathan Stone (1795-1868) of Westborough. Sophia (Buck) (Brigham) (Newton) Stone (1797-1882) was my 3rd great-grandmother, and had my 2nd great-grandmother Sophia Newton (1835-1923) by Thomas J. Newton (according to marriage and death records). Sophia Newton married Edward Hildreth (1831-1899) in 1851, and their daughter Hattie Louisa Hildreth (1857-1920) is my great-grandmother.